Labour former minister Chris Mullin has bid an emotional farewell to the Commons. 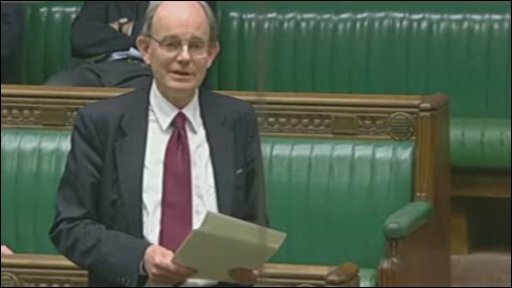 Leading an adjournment debate on 25 March 2010, Mr Mullin broke down as he told MPs that it had been a "privilege" to have served Parliament for 23 years. "There will be withdrawal symptoms - leaving now is either the best thing I've ever done or the biggest mistake of my life. At this stage I have no idea which. "I do know this however - I count it a privilege to have been born in a democracy and to have served in this place. The great thing about democracy is that although harsh things are sometimes said, we're not actually trying to kill each other. "Differences are ultimately resolved at the ballot box - one side wins, one side loses and the loser lives to fight another day. "Mr Speaker, those are the last words I shall speak in this place." Mr Mullin held ministerial positions in the Department of the Environment, Transport and the Regions and the Department for International Development before becoming a junior minister in the Foreign Office. He also served as chairman of the influential Home Affairs Select Committee. In his wide-ranging valedictory speech, he advised the next generation of politicians that it was imperative to "take Parliament seriously", warning that trying too hard to woo the media "always ends in tears". Civil servants had been able to wield too much power in recent years, he argued, due to the high turnover of ministers responsible for vital policy areas, such as policing. He hailed the achievements of the Labour government to date, arguing it had quietly redistributed wealth.